I have decided to try my hand at entering online challenges. What are they? Usually, a designer, manufacturer or retailer posts a contest on their blog challenging their readers to create a project. The challenge may either be to use a certain product or tool; or to create within a specified theme. Tim Holtz has challenged readers of his blog to make something using his Tattered Florals die from Sizzix. Now, I am an out-of-the-closet Sizzix addict. I have a large number of these wonderful die cutting tools and was trying to curb my addiction when Tim Holtz began designing for the company. His tattered florals dies is the second one I purchased (the first was the Fanciful Flight butterfly). So, thankfully, I didn’t have to go out and purchase a new die. Now, what to make and with what? The large wooden letter “B” was painted with acrylic paint and then sanded along the edges to distress it somewhat. 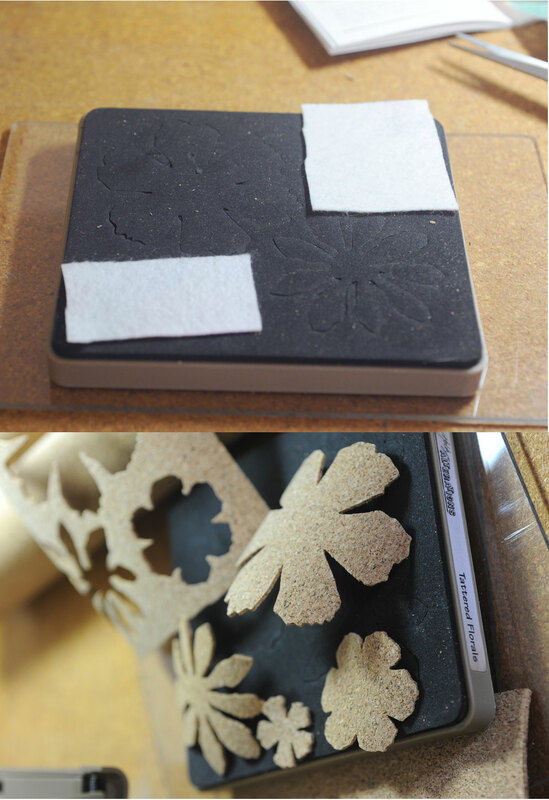 I used the tattered florals die to cut the cork and printed felt. The die cuts four different sizes and shapes of flowers. Since I wanted extra small flowers available, I cut small pieces of the felt just big enough to cover that part of the die. I didn’t end up using the small pieces, but they can go on another project. 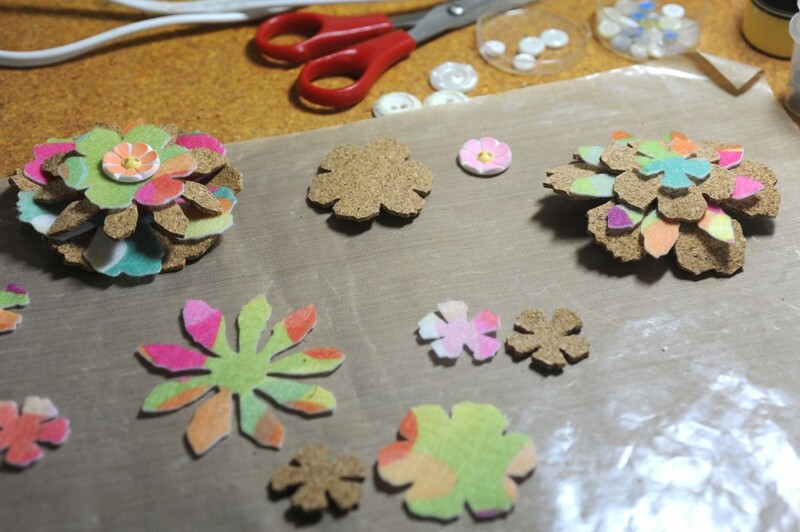 Cork and felt flower pieces are laid out to see which way they look best. One of the cork flowers broke when I picked it up so I tore off the petals, painted them with lime green acrylic paint, and attached them to the back of a button which was highlighted with banana yellow and bright pink paint. 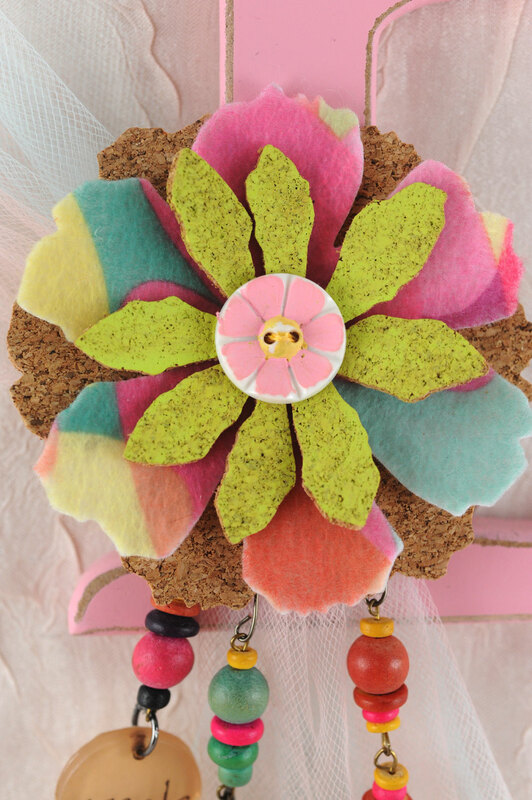 I added the largest of the flowers in both felt and cork and used yellow thread to sew all the layers together. I attached some light pink and light blue nylon tulle to the bottom left of the letter, then attached the flower. 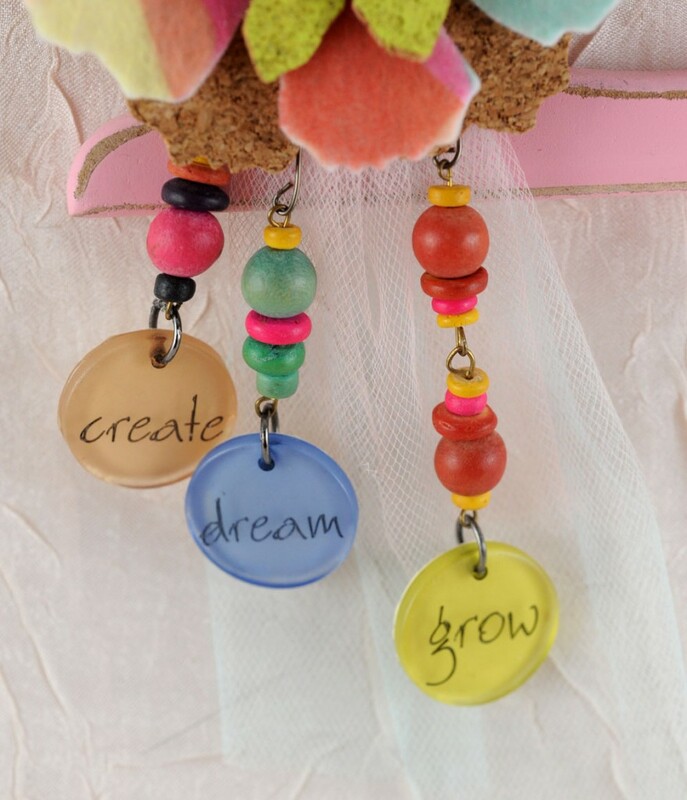 Underneath, I wired on some charms made from colored wooden beads and scrapbook embellishments. At the top of the letter, I made a hanger from simple loop links of wooden beads, attached to the back of the letter. 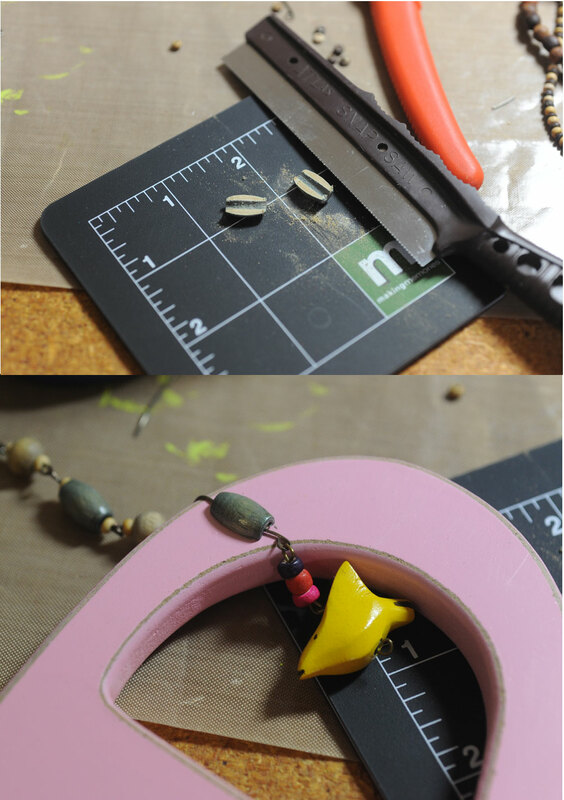 I had a wood bird bead that I wanted to add – another charm was made with it and a few colored beads. I wanted to hang this on the front of the letter, so I wired it on, but didn’t like the look of the wire on the front. I grabbed my Atlas saw (a gift years ago from an aunt who worked at Atlas – a maker of toy trains) and cut one of the wood beads in half. I attached this with Ranger’s Glossy Accents and set it aside to try. I’m not very patient and normally would have probably messed with it, but it was time for dinner, so it was allowed to dry overnight. The bird hangs quite nicely now and the wire is camouflaged. Now, pink is not normally my color but I am pleased with how this turned out. And the project was completed in time (Tim’s deadline is tomorrow, and Jo-Ann’s is the end of the month). Now – what will be my next challenge? What a cute little wall hanging! Great job for BOTH challenges! Beautiful!!! Love the use of cork!